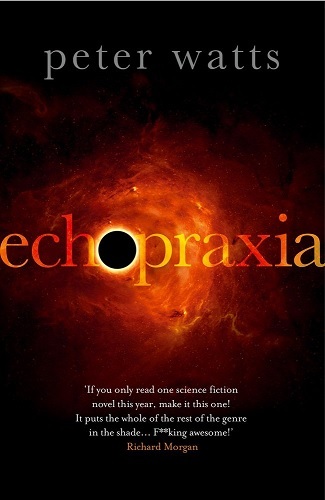 Aside from the occasional read of Baxter and Clarke, I’m not a seasoned hard sci-fi reader, but I enjoyed Echopraxia a lot. The UK edition I read featured a set of endnotes where the author cited some sources of research and talked about where some of the ideas came from. Peter Watts is an author heavily into the hard science of it all, as was apparent from a narrative heavy on technical terms and what some would deem ‘technobabble.’ It made a challenging read in some places when it was difficult to visualise exactly what was going on, but the novel won me over with its spectacular settings and a take on the faith-science debate that felt fresh in a genre where it’s becoming a somewhat tired theme. I’m usually allergic to stories featuring vampires because the horror behind them has worn thin, yet I found Valerie the most engaging character in Echopraxia (rather ironically, as a large amount of the dialogue is based on characters with few redeeming features squaring off against each other while she says very little at all.) The creepiness of Valerie lay not in the act of being a vampire itself but in the rest of her behaviour, and was responsible for some pretty clever trickery all round. From Dracula to Buffy to Blade and the Anne Rice novels I read as a teenager, I’ve seen enough of vampires to last for quite a while, yet here was a take on it that changed my mind about them being a must to avoid for just about any author. In Peter Watts’s hands, one vampire really worked, and there’s still life in the species yet. Echopraxia is highly clever and intricate in its surprises, demanding quite a lot of attention to detail for a reader like myself and then rewarding in spades. The only thing that stops this from being a five star review is that sometimes the hard science got in the way of what could have been a rollercoaster-tension narrative, especially in the second half. Don’t get me wrong, it wouldn’t have been the same book without the numerous info-dumps, which were quite creatively presented rather than just being encyclopaedia, but by the last quarter of the novel it was spoiling the tension rather than holding it back. I’d almost write that criticism off thanks to a brilliant ending though. No spoilers, but lets just say I had certain expectations that were almost fulfilled but not quite, and the not quite part of it actually improved on what I’d hoped for. Although by no means modelled on the SF classic, Echopraxia evokes a note or two of Hyperion in its setup: mismatched characters on a space ship with a mission who all have a past that’s interesting to the reader and a story to tell. Few inspire much sympathy, and indeed I wish I could have been more attached to the main character Dan Brücks, but he’s a good example of jerk-with-a-conscience done well. The people around him being arguably worse didn’t redeem him much, but the story of how everyone got to be where they are was one of the more engaging aspects. The characters in Echopraxia do play with reader expectations as well, and contribute well to an aggressive style of narrative with few details spared. There’s enough cursing to rival the average Sopranos episode and no detail in the violence is off limits. Through all this comes a bleak and cynical examination of the human condition and the likely outcomes for Earth that will result from it, and it’s all highly entertaining carnage. On a closing note, in a world where cinema has become obsessed with targeting family audiences and the days of films like Alien and Event Horizon seem long over, a film adaptation of this novel would be hugely refreshing. This is the kind of novel anyone longing to be treated like an adult by science fiction would do well to check out.